An increasing number of retailers, both small and large, are carrying these premium, high-quality goods across departments. This trend doesn’t appear to be slowing down anytime soon. According to the American Craft Spirits Association (ACSA), there were over 1,550 craft spirit producers in the United States. Growth has been constant within this segment, with 5.8 million cases of small batch liquor in retail sales in the United States in 2016. (That’s around 69.6 million bottle labels!) This equates to 3.0 billion in reported revenue that year alone! Many retailers and wholesalers surveyed in the study expect craft spirits to perform in line or exceed craft beer’s performance over time. Craft Spirits are often times considered luxury goods, with a revered degree of craftsmanship utilized to produce the actual product. The same attention to detail doesn’t stray away from the label on the bottle. In the ACSA report, the majority of retailers interviewed recommend that distilleries invest more into product branding to entice consumers to purchase their goods versus the big-name competitors. Craft distilleries are taking note, as label converters are reporting that a common request from distillers is advanced decoration. Applications that pop are common requests, and the brand and printer work together to develop something out of the box. We’re talking cold foils, metallic spot colors, unique varnish patterns, all printed on non-traditional substrates. We have even seen customers utilize a fabricated wood label stock, which runs smoothly through our Digital One label press. Speaking to Digital One, the production unit is a great resource for converters looking to grow or support an already strong book of craft business, which is innately short run. This entry-level digital label press was created specifically for micro and short run jobs, and due to the hybrid nature of the machine, can support inline decoration. The majority of craft spirit producers are classified as small producers, which means much of the work will be categorized as low-volume when compared to job runs for the big brands on production flexo or digital hybrid. 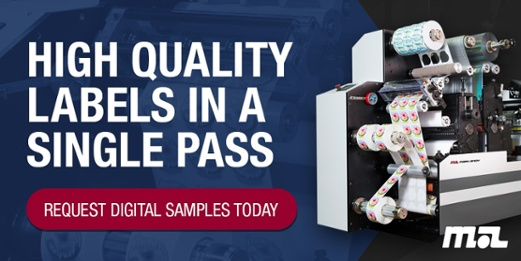 Traditional digital presses are ideal for short run work but lack in the ability to provide advanced decoration capabilities or support for atypical materials. Digital One merges this gap between the benefits of printing short runs on traditional digital presses and the need for advanced decoration in-line. 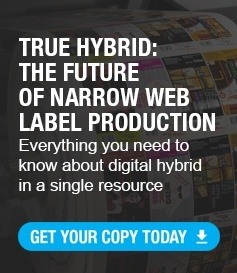 In the below infographic, we examine how market trends in the craft spirit industry paired with our entry-level digital hybrid label press can impact your print business and drive high levels of revenue. The pressure sensitive label analyzed in the infographic focuses on the profit gains and cost implications related to its production. In an industry that is highly regulated and costly to enter, successful distillers deserve a round of applause. Premium product, however, is only as great as the packaging that identifies it. Branding for a market as competitive as small batch spirits need compelling packaging that pulls customers to their products versus the competition. Luckily, converters and brand owners that utilize digital hybrid technology to produce these types of job have that competitive advantage.